Americans were treated to a “fairy tale” May 4th when the Department of the Interior staff posted this link that features a captioned photo more appropriate for the Brothers Grimm than the stewards of the nations public lands. Star trails above the Bonneville Salt Flats in Utah almost look like a tunnel into hyperspace. These salt flats are made of approximately 90 percent common table salt, weighing millions of tons. The crust is up to 5 feet thick near the center of this unbelievable landscape that stretches over 46 square miles – just slightly smaller than the size of San Francisco. It’s the perfect way to celebrate #MayThe4thBeWithYou! Fairy Tale #1: Constant, uninterrupted potash mining of the Bonneville Salt Flats (BSF) robbed the natural wonder of its thickness decades ago. There has not been five (5) INCHES, let alone five FEET of salt crust, since 1988 when a US Geological Survey made measurements of the shifting salt surface. Fairy Tale #2: Depending on which assay results one prefers, the chemical make-up of the salt is NOT 90% NaCl (salt) but has ALWAYS been 98-99% salt. Fairy Tale #3: It has been DECADES since recreational users have seen 46 square miles of salt. The actual usable surface is less than 20 square miles. This, despite the BLM designating the International Speedway an “Areas of Critical Environmental Concern” many years ago which has brought little relief to the withering salt crust playa while providing a steady stream of revenue to Kaiser Chemical followed by Reilly industries and now Intrepid Potash, Inc. In 1997, a voluntary salt lay-down project was begun to return salt brine to the Bonneville Salt Flats International Speedway located North of Interstate 80 and listed on the National Register of Historic Places – waste product from the potash mining that has collected HUNDREDS of MILLIONS of tons on the South side of the highway. Once a promising source of ecological remediation, the current mining company, Intrepid Potash, has never equaled the test program restorative levels witnessed in 2001 when Don Vesco set the current World Land Speed Record of 458MPH driving on an 11-mile race course – the last time such length was observed. Why must it be such a quixotic quest to get attention of our national leadership for corrective action? Digging into how this happened, we found that the DOI staffer lifted copy off the BLM website. 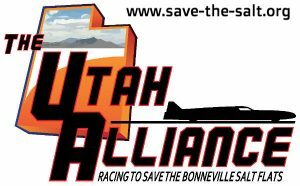 The racing community is working closely with the BLM to pursue a comprehensive restoration program. Part of that effort will require the BLM to update information shared with the public to reflect the current conditions of the BSF. We look forward to having five feet of salt crust so that this is no longer a fairy tale but once again a fabulous raceway. This entry was posted in Member Articles, Past Events by admin. Bookmark the permalink.